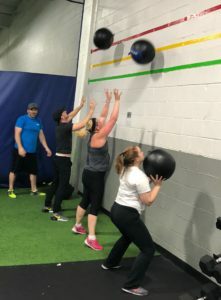 Functional training is an adult class, which is centered on helping individuals move better and feel better. We work on squatting, hinging, pressing and pulling when strength training. Body weight cardio is also a staple for the classes to burn calories to lose that excess weight. When thinking about “functional training” think about “primal movements”. We want our members to move freely without restrictions to live a long healthy and happy life with the training they learn from class.